I've been struck recently by the importance of water and how vital it is to life. Some say freshwater is the "new oil" as it is increasingly becoming the most critical scarce resource in our world. As it is, many areas around the world do not have access to clean, safe water. Lack of access to clean, safe water leads to poor health and poverty, and keeps children from attending school when they must walk for miles to obtain it each day. Recently I was given $100 by Newsong LA Church with the challenge to invest the money in God's Kingdom. I am using this money to provide clean, safe drinking water to a village community in South Sudan. This area is in great need as it is currently recovering from decades of civil war. 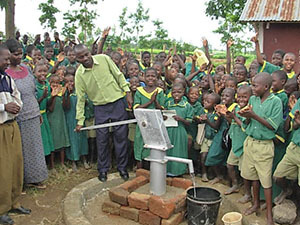 With your help, I would like to raise $2500 to help fund an entire well project for a village in South Sudan. I am partnering with two agencies that are actively working in this area: The Water Project (http://thewaterproject.org/wells_for_sudan.asp) and Water Harvest International (http://www.whiwater.org/). I encourage you to check out their websites to learn more. Would you like to join me in supporting this cause? A donation of any amount, be it $1 or $100, will go a long way in providing clean, safe water to those who need it. 07/13/12 Josh Rosebrook $10.00 Josh Rosebrook Skin and Hair Care is excited to help! 01/08/11 David Eze $15.00 You're almost there. 12/21/10 Michelle Li $45.00 Good job Daniel on coming up with this awesome idea! It's so encouraging to see God's money put to good use for His Kingdom. I hope this little bit helps! Go clean water! 12/12/10 Daniel Healy $28.00 I took the Water Challenge and saved $28 for the well project in Sudan. 12/04/10 Daniel Huang $50.00 Way to go Daniel and James! You're definitely multiplying what God has given you! 12/01/10 Randy Boer $25.00 This is a great idea Daniel. It will bless many people. 11/30/10 Mike and Charissa Lee $100.00 I was so excited to see that you got $100 because I knew you would make good use of it for the Kingdom! Go clean water! 11/27/10 David Yanez $30.00 Glad to support the cause! 11/23/10 Amanda & Paul Chavez $100.00 Keep up the great work, Healy! God Bless! 11/19/10 David Eze $15.00 With God all things are possible. 11/18/10 jennifer PRODIGALIDAD $20.00 I really admire what youre doing. keep up the good work. 11/15/10 Daniel Healy $100.00 Here's our 1st donation!